While road closure signs and bright orange cones have been a headache for downtown El Paso commuters, some business owners see them as a sign of improvement. Despite slow business due to construction, the downtown revitalization effort has maintained its popularity among proprietors. “Everything they’re building, the stadium, the San Jacinto Plaza, the lofts, it all makes downtown more safe,” Healthy Bite owner, Patricia Terrazas De Herrera said. Healthy Bite hopes that all the change will provide an incentive for more people to visit the area. Currently their customer base are mostly employees who work in the area. “We cater to the workers in the area…lawyers, judges, etc.,” Terrazas De Herrera said. Downtown business owners, like Terrazas De Herrera, are hoping for increased foot traffic as a payoff of the constant projects and constructions. Such beliefs coupled with the continued support of organizations, like the El Paso Downtown Management District, and the city is causing many business owners to support more revitalization efforts. Businesses such as Proper Printshop see the increased activity over the past several years as a positive. 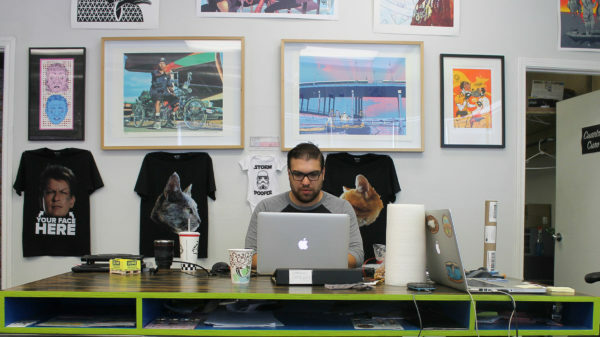 The print shop’s custom t-shirts and posters are produced in a space not far from Downtown and there are plans to open a storefront in the Roderick Artspace Lofts, a new building downtown located at 601 N Oregon St. Though the print shop does not rely on foot traffic, said owner, Jonathan “JJ” Childress, he still appreciates the city’s efforts. Currently, the plans for a storefront are being stumped by the Streetcar Project, another revitalization effort by the city. Though both business owners support the revitalization efforts, some revitalization projects have gathered opposition. The planned downtown arena has been a major topic of controversy because if built, it would displace residents that have been fighting for their land. This has stalled plans from moving forward. It has been found that only four percent (4%) of downtown workers actual live in the area. This information was found in a survey conducted by the El Paso Downtown Management District in 2011. Another issue for downtown commerce has been the construction. Childress, who is also an owner of Nomu Cafe located at the Artspace, mentioned the lack of business due to road closures. But like other business in the downtown, like Pizza Joint, Tool Box, and Delight, Childress believes the construction is a burden worth the reward of a completed project that will hopefully attract new customers. Childress isn’t the only business owner who believes this. “It’s a blessing to be a part of the revitalization progress and to see how beautiful it’s turning out,” Terrazas De Herrera said. But the downtown area is far from perfect, Childress, who graduated from the University of Texas at El Paso with a Bachelor in Business Administration in accounting and finance and masters in business administration, argues there are still struggles as a business owner in the area. La Morena, a Mexican food restaurant, is one of the businesses that was affected the most. The restaurant ultimately decided to close its downtown location doors February 1, 2017. The owner, Frank Mares Jr., in an El Paso Times article, revealed the struggle of operating a business when surrounded with construction and rising rent pay. The Streetcar Project won’t be completed until late 2018. This means a series of road closures will be in effect for the following weeks as construction begins its final stages. The future of the arena however, is still unclear. “I never thought I’d be working downtown, but I love it,” Terrazas De Herrera said.